to help you develop a mobile site that both delights your customers and drives conversions. Study participants with a specific need, especially those visiting retail sites, turned to site search to find what they were looking for. Participants were quick to abandon sites that returned irrelevant search results or a large set of results that they were unable to narrow. Key takeaway: Ensure site search is visible on the homepage via an open text field, returns relevant results, and is equipped with advanced features, like auto-complete and filters, to get users what they want quickly. If presented a choice, study participants would often tap on the link to visit the “full site” due to a perception that they’d be missing out on something by staying on the mobile site. Choosing the “mobile site” implied to them that they were not getting the “full” experience, when in reality, the mobile site offered most, if not all of the functionality in an easier-to-view format. Key takeaway: If your mobile site provides the same content and functionality as your desktop site in an easier-to-use format, then there is no need to provide a link to the desktop site. If you do decide to provide users with a link to the desktop site, then use terms like “desktop site” instead of “full site” to be clear that both sites offer a complete experience. Unsurprisingly, it was easier for participants to navigate mobile-optimized sites on their mobile devices than desktop sites on their mobile devices. However, sites that included a mix of desktop and mobile-optimized pages were actually harder for participants to use than sites with all-desktop pages. Key takeaway: To improve user experience, task completion and conversion rates, go all in and optimize your entire site for mobile. If launching in phases, then make sure users don’t have to traverse between desktop pages and mobile optimized pages to complete their tasks. To review our complete findings, download the Principles of Mobile Site Design from Think Multi-Screen. Use the principles to review the effectiveness of your existing site, optimize your conversion funnel or to guide the creation of your first mobile-optimized site. Need help building or optimizing your site for mobile? Find recommended vendors and special AdWords customer offers on Think Multi-Screen. Mobile empowers consumers to connect with your business at anytime and from anywhere. But are you ready to be there for them in the moments that matter? To truly meet the needs of your customers, your mobile site experience should allow them to quickly and easily find what they’re looking for without sacrificing richness of content. While there are a lot of expert opinions about how to do this, very few are based on actual data and research. So we partnered with AnswerLab to study more than 100 mobile users as they completed conversion-focused tasks across a diverse group of sites. From this research, we developed 25 principles of mobile site design to help you develop a mobile site that both delights your customers and drives conversions. ). We’re excited to see how large and small advertisers around the world will put these new products to work, to grow their businesses and find new customers. These new features will all roll out over the course of the next few months, and we’ll provide more details for you, right here on the Inside AdWords blog, as they launch. People are living their lives online, looking for the content that’s most useful for them -- sometimes this content is on websites, sometimes in mobile apps. For many years, we’ve offered popular formats through Google search ads and our AdMob network to help you promote your app. Since they launched, we've helped businesses drive hundreds of millions of app downloads with these offerings. Today, I announced the next generation of these features across Google search ads, our Display Network and YouTube. Learn more. 1. Better discovery: For businesses looking to promote app installs on the AdMob network, we’ll enable you to reach people who are your most likely customers, based on the apps they use, the frequency of use and the types of in-app purchases they make. For example, if you exercise regularly and use an app to measure how far you run, you might see an ad for an app that helps you measure the foods you eat and calories consumed. On YouTube, we’re enabling app installs as an enhancement to the current TrueView offering. 2. Easier re-engagement: Lots of businesses are able to get their apps onto a device, but might never see their customer again. Today we announced a new app re-engagement campaign type in AdWords for both search and display so that consumers can be taken directly into already-installed apps. 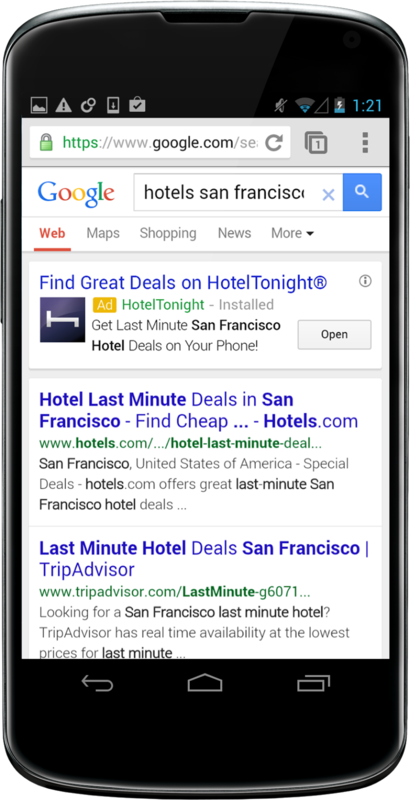 For example, if someone has the HotelTonight app installed on their phone and searches for “hotels in San Francisco” on Google.com, they can go directly to the specific page in HotelTonight about SF hotels, instead of being taken to the app’s main landing page. 3. Enhanced measurement: In AdWords you’ll soon be able to measure conversions across the entire lifecycle of the app - from install to re-engagement to in-app purchases. Last year, we introduced Estimated Total Conversions to help you measure the full value of your campaigns, including phone calls and conversions that occur across devices. Many businesses are already using this to inform their bidding and budgeting decisions, and to find new customers. For example, photo publisher Shutterfly measures 60% more conversions when factoring in mobile-to-desktop conversions. With this insight, they decided to include all their keywords on mobile devices, which has helped them find a lot more customers. The feedback on Estimated Total Conversions has been great, so we’re continuing to invest in this product. As people search more online for local businesses and then go into the store to make purchases, we're testing ways to measure the effectiveness of search ads at driving in-store sales, using anonymized purchase data from retail partners. RKG and fashion retailer, Express, very early testers, found that overall return on ad spend increases 102% when including offline sales in online advertising results. We’re excited to invest here because over time it will give people a better experience, as more businesses see the value and invest in local information like directions, inventory information, promotions and offers. For businesses looking for new customers, the increase in constant connectivity means that the scale of your campaigns is growing, and you've told us you want help to manage your campaigns more effectively. 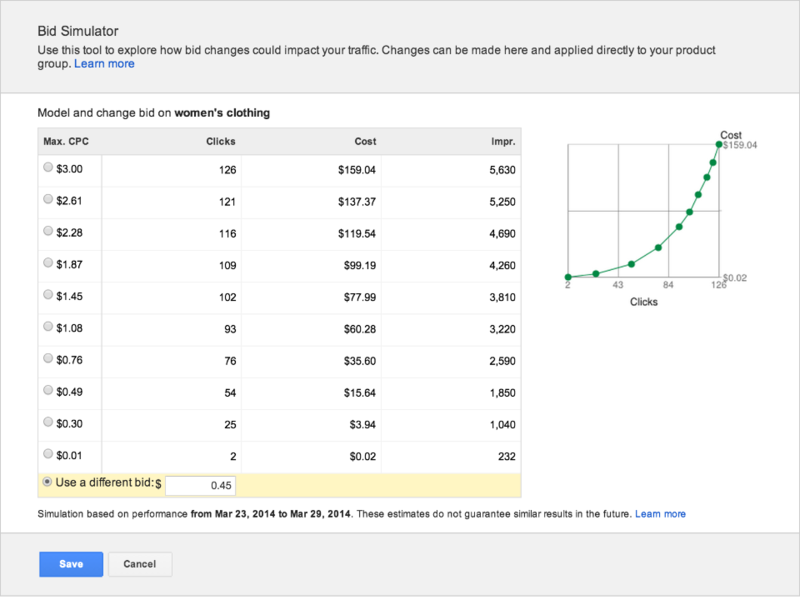 So, we're bringing enterprise-class workflow, reporting, and optimization tools to AdWords. 1. More bulk actions: With new bulk capabilities for extensions and settings, you'll be able to easily set up campaign settings like location targeting and ad rotation across all your campaigns (even if you have thousands of them!). This should be particularly useful for big seasonal promotions, when you might want to update all of your campaigns at once. 2. Automated bidding: Building off of the momentum that we’ve had with automated bidding, we’re adding the ability for you to maximize the number of conversions or the total value of conversions. For example, if you’re a car maker, you’ll be able to set up your campaign to allocate your budget in a way that maximizes the number of people who visit your site to design a custom vehicle. 3. Advanced reporting: To help you analyze your data better (without the endless downloading and re-formatting of data) we’re providing you with new multi-dimensional data analysis and visualization tools so you can perform most, if not all of your data analysis, right here inside AdWords. We’re also making it easy for you to turn your data into tables, graphs and charts so that you can download them and share with your teams. 4. Your own lab: One of the great benefits of AdWords is that it offers an incredible platform to test and tweak live campaigns. So we’ve built a lab inside AdWords for you to prepare ideas for your campaigns, see what they’ll look like, and then run tests with live traffic as an experimental trial. You can experiment with almost anything in your campaign, including bid changes, new keywords, different campaign settings, special bids for times and locations, different kinds of ad formats, and more. We think you’ll like it! It’s always inspiring for me to hear how AdWords is delivering useful information to people at the right moment and helping businesses succeed. Thanks to everyone who attended the AdWords Performance Forum or watched the livestream. I’m excited to see how you put these new features to use, and we’re looking forward to hearing your feedback. People are constantly connected, moving seamlessly between screens, sites and apps while on-the-go. This makes the best ads more than just messages sent to various devices. Instead, ads are now most effective when they connect people with the information, content and places that matter most to them, at the moments they are looking. This morning, over 170 search marketing experts attended the AdWords Performance Forum where I shared our latest AdWords updates (you can watch a replay of the livestream here). We’re excited to see how large and small advertisers around the world will put these new products to work, to grow their businesses and find new customers. These new features will all roll out over the course of the next few months, and we’ll provide more details for you, right here on the Inside AdWords blog, as they launch. or watch below. We look forward to engaging in the conversation with you at #StepInsideAdWords. Welcome to the Inside AdWords livestream! Today, Jerry Dischler, Vice President of Product Management, AdWords, announces the next generation of advertising innovations. Tune in to the livestream on YouTube or watch below. We look forward to engaging in the conversation with you at #StepInsideAdWords. Check out Think with Google’s full collection of Search Insights articles for more examples of how to use search data to inform your marketing. Oscar Night. The Olympic Games. Bonnaroo. We think of produced events as finite moments in time. 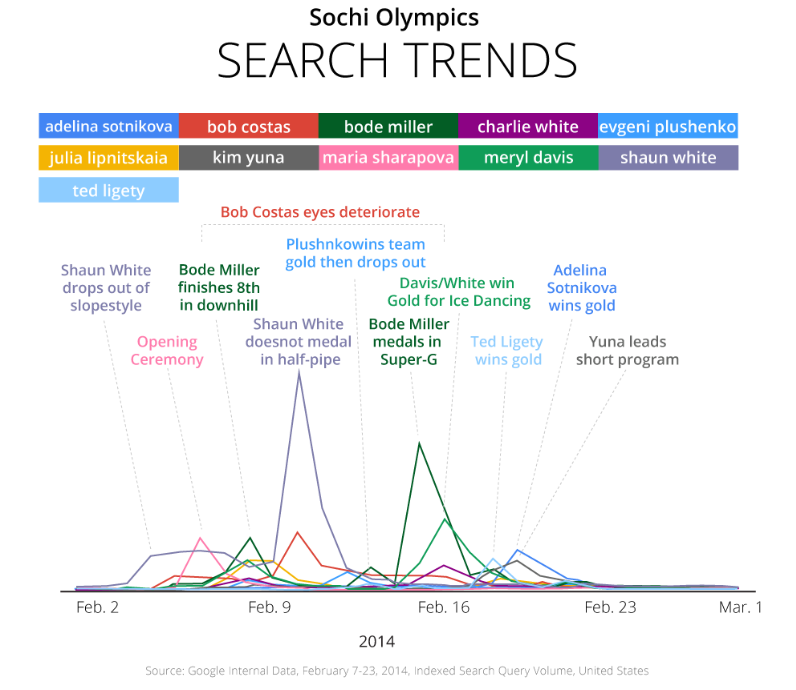 But as we saw with Bob Costas’ eye and “Adele Dazeem”, many of these “finite” moments actually create a much larger window of interest—and opportunity—online. You could say that for every offline action, there is a digital reaction. And it starts with search. By understanding search data and its role before, during and beyond an event, marketers can prepare to respond to consumers’ needs and desires in new and timely ways. Think with Google looks at how these search insights can help guide a thoughtful event strategy and provides tips for marketers to get the most value from events. Read the full article. to a limited number of advertisers as a new way to amplify content and create conversations across the web. +Post ads let you to take a piece of your public Google+ content, like a photo or video, and turn it into an engagement ad that runs across the Google Display Network. Starting today, +Post ads are available to all advertisers who meet a minimum threshold of Google+ followers. 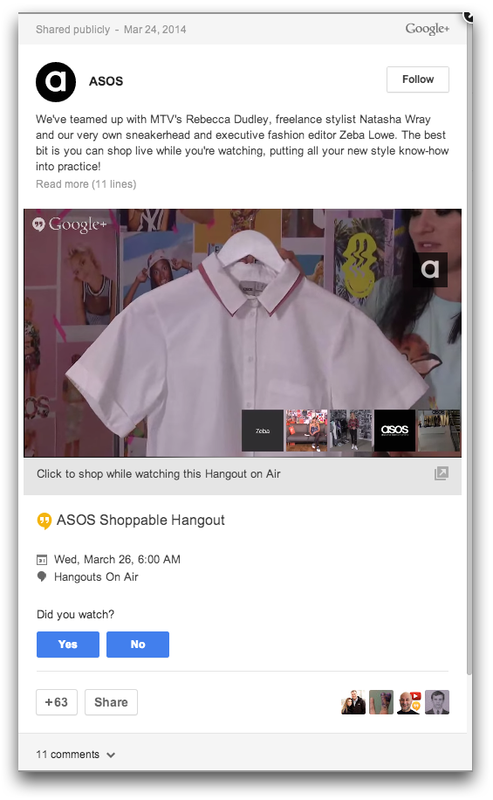 We’re also piloting two new features - promoted Hangouts on Air and automatic post promotion - to help you create compelling ad experiences and make it easier to extend the reach of your social content. 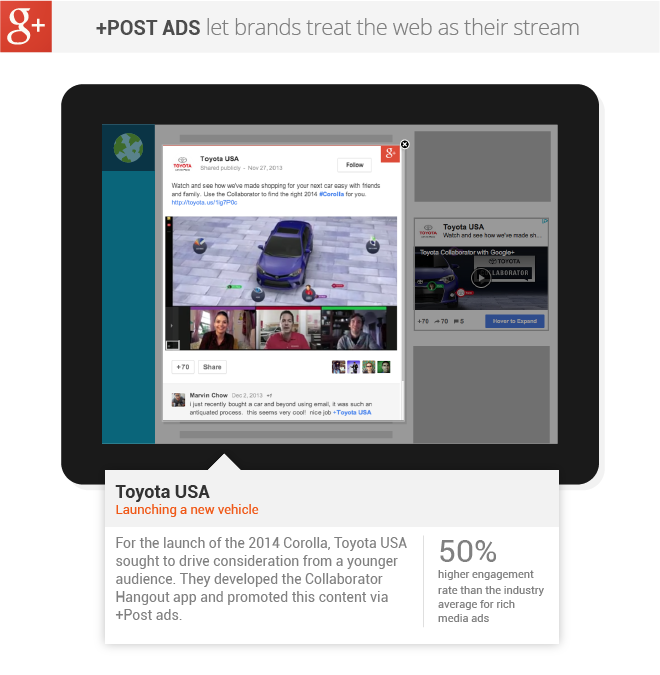 For the launch of the 2014 Corolla, Toyota USA sought to drive consideration from a younger audience by promoting their Google+ content with +Post ads. For this campaign, Toyota USA saw a 50% higher engagement rate than the industry average for rich media ads. To raise awareness with their potential customers, prAna, a yoga and climbing inspired apparel company, incorporated +Post ads into their existing AdWords display campaigns. “We focused on highly targeted audiences that best reflect the interests of our core consumers, such as yoga, climbing, outdoor lifestyle etc. We chose the most hyper relevant Google+ content to promote to each targeted audience, to ensure high engagement rates,” says Karen Hardy Online Marketing Manager. The European Parliament worked with Ogilvy Brussels to run a campaign in 11 countries encouraging European citizens to cast their votes in the upcoming EU elections. Koen Van Impe, CEO Ogilvy Brussels, found the combination of an easy to create ad, the potential reach and targeting of the Google Display Network, and the powerful ad format promising and saw engagement rates that were 50% to 100% higher, and at a lower cost-per-engagement, than previous campaigns. You can now promote your Hangout on Air with +Post ads that lets users take specific actions before, during, and after the broadcast. Users can RSVP prior to the Hangout, watch the broadcast live, and view a recording after the event. ASOS hosted a shoppable Hangout where fans could check out styles and make purchases from a collection created in collaboration with a global activewear brand. The event was promoted live in a +Post ad, driving awareness and live tune-ins of the event on relevant web sites. In total, 71% of live viewers for the Hangout watched from a +Post ad. At any given moment, there is someone interested in your brand, but it’s challenging to make sure you reach people at every moment that matters. Now you can automatically promote your most recent Google+ post, and pay only when people engage with your content, extending the reach of your social content across the web. Lean more about +Post ads and Google+ by visiting the Google+ for brands site. Last December, we introduced +Post ads to a limited number of advertisers as a new way to amplify content and create conversations across the web. +Post ads let you to take a piece of your public Google+ content, like a photo or video, and turn it into an engagement ad that runs across the Google Display Network. (MRC) announced that it is lifting its advisory on transacting on viewability for display advertising, originally issued in November 2012. In taking this step, the MRC is signaling that great strides have been made toward the goal of transacting display advertising using viewable impressions, and the industry is ready to begin the process of adopting viewable impressions as a standard metric. We applaud this move and are thrilled to see the industry move closer to the reality of a true viewability currency. Google has been a longtime supporter of this effort and we’ve partnered with the industry, the Media Rating Council and the IAB, as part of the Making Measurement Make Sense (3MS) initiative, to help guide the definition and adoption of a viewable impression standard. Last April our viewability measurement solution Active View received accreditation by the Media Rating Council and, in the coming months, we’ll be making Active View reporting available to all DoubleClick customers across our platform. We believe that giving marketers, agencies and publishers access to a common, integrated viewable impression metric will set the foundation for viewable impressions to become an actionable currency. But measurement alone will not make viewable impressions a currency. To become a currency we need technology that allows advertisers and publishers to not only measure, but also transact on viewable impressions. In December, we took our first step toward making viewable impressions a true currency by giving advertisers the ability to target and buy only viewable impressions on the Google Display Network. We’ve seen a strong positive response as thousands of advertisers and brands have adopted viewable impression buying on our network, but we’re not stopping there. We’re investing heavily in Active View and working quickly to enable our DoubleClick platform clients to value, buy, sell, serve and optimize to viewable impressions across the web. The MRC announcement represents an important milestone in the journey towards a viewable currency. As marketers and agencies adopt the viewable standard we can start to build a new display market that is more transparent and actionable for brand marketers. On Monday, the Media Rating Council (MRC) announced that it is lifting its advisory on transacting on viewability for display advertising, originally issued in November 2012. In taking this step, the MRC is signaling that great strides have been made toward the goal of transacting display advertising using viewable impressions, and the industry is ready to begin the process of adopting viewable impressions as a standard metric. We applaud this move and are thrilled to see the industry move closer to the reality of a true viewability currency. Size your opportunity with Bid Simulator - To provide more actionable insight into your PLAs, we’ve been rolling out a Bid Simulator that’s now available in all Shopping campaigns. With a Bid Simulator, you can now estimate how bid changes could impact your impressions, clicks or costs. Options to create a Shopping campaign - In the coming days, we’ll be adding some options to help you get started. 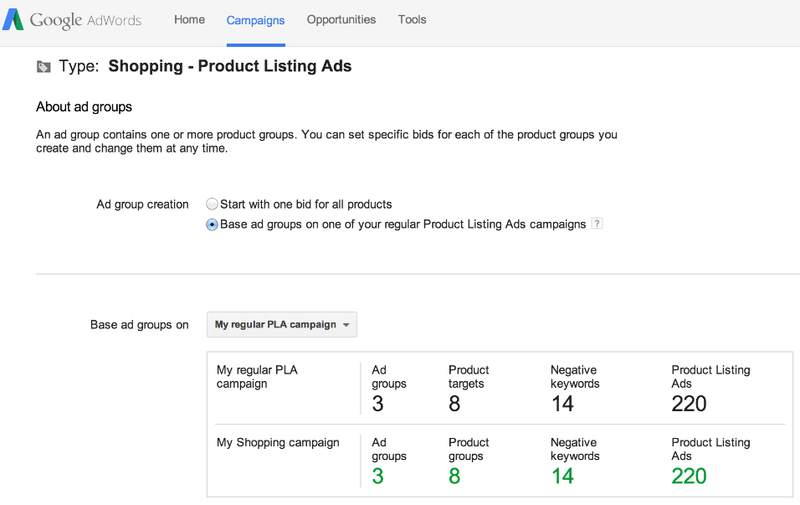 You would be able to create a Shopping campaign from scratch or, for many of you, use one of your regular PLA campaigns to create similar product targets, negative keywords or promotional text. Multiple ad groups for advanced retailers - While many of you will be happy with your Shopping campaign as is, we’ve heard from advanced retailers that they’d like to create multiple ad groups. It’s now possible to do this within a Shopping campaign. Shopping campaigns offer a truly retail-centric and seamless approach to PLAs. We're very excited by the positive feedback we've heard so far and will continue to build tools and features into this new campaign type to help you manage your PLAs. Thus, we'll be retiring the regular PLA campaign type and asking all PLA advertisers to upgrade to Shopping campaigns by late August 2014, at which time all remaining PLA campaigns will be automatically upgraded. Over the next few months, we’ll share more information and release more tools to help you upgrade your campaigns and manage them at scale. We encourage you to start planning your upgrade to Shopping campaigns today to take full advantage of the new features as soon as possible.